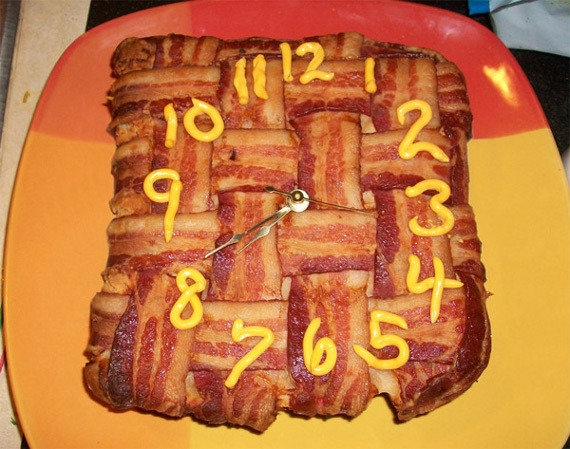 This is a functional clock made out of bacon woven over a biscuit batter core, with Cheez-Whiz as the numbers. It was created by DeviantArtist Malcoda. She provides some kind of explanation about how the thing’s meant to represent Americans and time consumption and stuff, but I just think that’s artsy-code for BACON. Unfortunately the Bacon Clock is no longer telling time, because Malcoda totally devoured it. And who can blame her? I never mastered the art of reading time, but even I can see that this thing says IT’S EAT ME O’CLOCK!